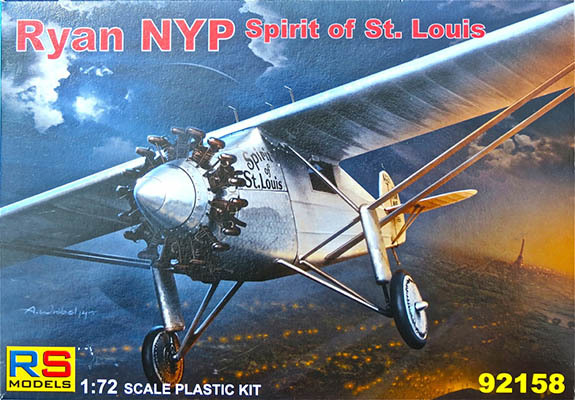 In 2006 and 2007, I became deeply involved in researching details of the Ryan NYP, better known as the Spirit of St. Louis. The SoSL was flown from New York to Paris May 20/21, 1927 by Charles Augustus Lindbergh to claim the $25,000 Ortieg Prize for the first such non-stop flight. This one event did more than any other in aviation history to make the world air minded. The purpose of those researches was to support the building of the new Revell 1/48 scale kit of the plane. My First Look review appeared in the February 2006 issue of Internet Modeler and my Build Review appeared in the July 2007 issue of IM. The model designation, "NYP," refers to New York Paris. 45 days after Lindbergh's record flight the Japanese newspaper Mainichi Shinbun ordered an exact replica of the NYP from Ryan. The NYP-2, J-BACC, c/n 36 (for reasons unknown Ryan assigned no c/n to the NYP) was delivered to Japan in late September of 1927. It was then flown to Japanese national records for distance, 2000 km (1243 miles) and endurance, 13 hours, 23 minutes, by Fumeo Habuto who had to stay, mostly, under 304.8 m (1000 feet) due to poor weather on the measured circular course over central Honshu. And now we have the very good 1/72 scale kit by RS Models from the Czech Republic, from which either Lindbergh's NYP or Habuto's NYP-2 can be built. The kit is packed in a stouter than usual, for a Czech company, end-opening box. I really dislike end-opening boxes. Yes, I know they are cheaper to make than lidded boxes but lidded boxes make kits easier to handle becoming, in effect, two convenient trays when open. The contents of said box are a six-page, three-sheet folder of instructions defining assembly in 18 steps; these pages include a parts map, a very brief history, and a page of ads for new RS releases. Unusually, for a contemporary kit, the colors and markings guide is printed in full color on the back of the kit box rather than being included in the instructions. This is a very useful and attractive presentation. 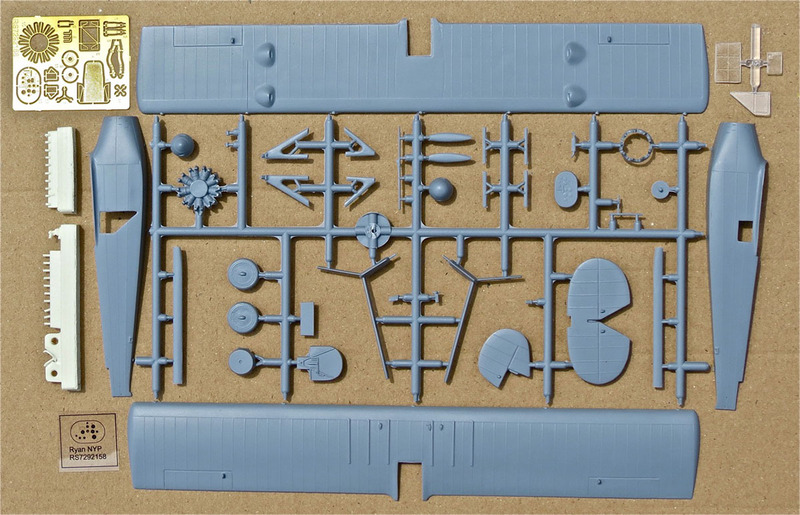 There is one sprue tree of 41 parts molded in medium gray colored polystyrene, one sprue tree of three parts in clear polystyrene, two feed bars of 22 parts cast in light cream-colored resin and one fret of 15 parts photo-etched in brass. Because of all the research I did for my 1/48 SoSL, I am probably not the best person to make a balanced, objective appraisal of this kit as I am looking for accuracy, detail and perfection. The kit is very good; far better than its 1/72 scale antecedents and built straight out of the box will make a quite acceptable addition to any collection of historically significant airplanes. The PE part for the inside of each wheel looks suspiciously like the inside of a brake drum. Neither the NYP nor NYP-2 had brakes so do not use these parts. Neither plane had shoulder straps so do not use that PE part either. When weighted, by the airplane on the ground, the fabric wheel covers were wrinkled. The kit's wheels are smooth on both sides; carve some wrinkles based on your study of photos of the plane. The long pitot boom ends in two small probes not reflected by the kit part. The skylight window provided in the kit is flat; the original was slightly peaked at the rear to mate with the top center stringer that runs from the rear wing spar to the fin. The kit omits the, clearly visible, magnetic compass mounted on the center stringer of the skylight over the pilot's head. The molded-in lift handles at the rear of the fuselage should be replaced with new handles bent from suitably sized wire. The fin does not mount flush with the top of the stabilizer as the kit has it. You will have to study photos to understand and replicate the correct mounting of the fin. The kit provides no frame for the slide-out periscope in the left cockpit window. The instructions are unclear as to which of the two spinners provided in the kit to use. The original, short, rounded-nose spinner with the swirlies, split on the ferry flight of SoSL from San Diego to New York and was replaced for the record flight with a locally spun spinner that was longer and more pointy with no swirlies. The NYP-2 was built with a duplicate of the original short spinner with swirlies. A. More louvers were cut into the engine cowling aft of the engine. B. The wheels were reversed placing the access to the valve stems of the tires outboard. C. The half-teardrop fairings over the outboard axle stubs were left off. D. Two flare tubes were fitted to the belly aft of the cockpit. The decal sheet does include the flags of all the nations added to the plane on the Latin American Good Will Tour. The decal sheet does not include four "J"s for location at mid half-span, over and under, both stabilizers on NYP-2. I suggest you ink-jet, or laser, print your own decals for these. The colors and markings guide would have you paint the rudder of the NYP-2 white for its national record flight in 1927. It was actually doped aluminum like the rest of the fabric-covered areas on the plane. 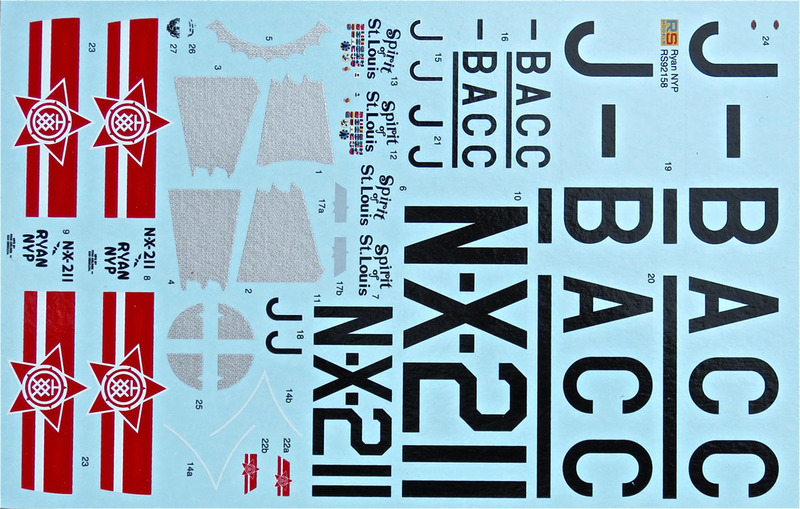 The decal sheet does not include the text "DAIMAI nbr XI" above the "J" on the rudder. Do the artwork and ink-jet, or laser, print your own decals of these missing markings. The kit does not provide for the two extra windows cut into the cockpit sides of NYP-2 when it was used for photo and liaison duties after its record flight. The added windows each had a thin frame of bright aluminum that stands out against the blue fuselage. The instructions also make no mention of the fact the NYP-2 had the Lindbergh periscope for its 1927 record flight but that it was removed subsequent to that flight. The NYP-2 had a later version of the earth-inductor compass generator drive, which was a small squirrel-cage device instead of the four-bladed cupped windmill used on NYP; like the windmill it was mounted on a short mast on the spine of the fuselage. The decal sheet includes two mysterious, blotchy decals, Nos. 26 & 27, for the spinner of NYP. I find no photo evidence of these on either spinner. The N registrations on the decal sheet for NYP appear to have been copied from the Revell 1/48th scale decal sheet and are completely inaccurate – even the proportions of the dashes are wrong! Refer to Dale Caldwell's drawings in the Cassagneres book, listed below, for the correct proportions of the registrations over and under the wing and on the fin. Again, you will do best to create the artwork for the registrations and ink-jet, or laser, print your own decals. Both planes had a small venturi on the forward right wing strut just outboard of the fuselage; this is not included in the kit. Note that the swirlies provided on the RS decal sheet in the kit do not look very good. When I did my 1/48 scale NYP I liked the way the Revell swirly decals looked and asked friend Ken Murphy to scan them, stitch them together and print them for me on clear decal stock in 1/72nd scale in anticipation of future needs. 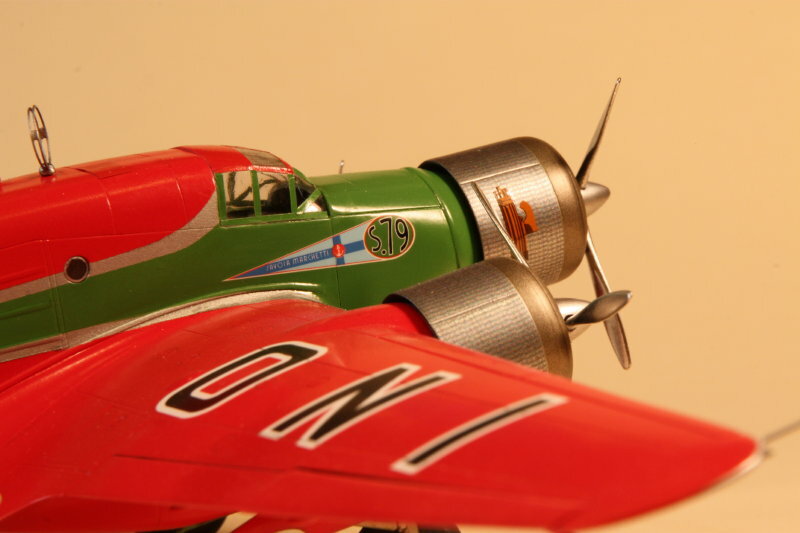 He did a beautiful job as you can see by the photo here of these decals applied to the cowlings of Tim Nelson's Savoia Marchetti S.M. 79 Corsa. My next use of them will be on a 1/72 Hisso Ryan M-1. For how to make decals yourself see Ken Murphy's article on his Turkish Albatros. Note also that Dale Caldwell's drawings of NYP in the Cassagneres book are the best to be found. This RS kit is very good and is much, much better than its two predecessors are in 1/72 scale. Buy at least two so that you can build both an NYP and an NYP-2. I bought mine at Emil Minerich's Skyway Model Shop in Seattle for $34.95 plus Washington State, King County and Seattle's combined sales tax of 9.5% ($3.32); net price $38.27. That is a bit pricey for a 1/72 kit but it is a good kit and after all it is only money and life is short. The Spirit of St. Louis: Charles A. Lindbergh, Scribners, USA, 1953. This book is the carefully crafted, account written after WWII to supplement C.A.L. 's original book, We of 1927 which was written quickly while the event was fresh to capitalize on the moment for sales.